He gets to spend some time at the beach before it gets crowded, when it’s still possible to appreciate the quiet of the lakefront, and I get some much appreciated morning quiet time at home when I don’t have to deal with an energetic pup running around demanding most of my attention. On these mornings, I tend to putter. I make a pot of coffee, browse the Internet, put on some quiet music, and then, eventually, after I’ve exhaled the craziness of the preceding week and let some quietness soak in, I meander over to the kitchen for some leisurely breakfast making. Muffins might be Dan’s favorite sweet breakfast. Or at least they’re his favorite of the kinds of breakfast baked goods that are easy enough and wholesome enough that I make them with some some frequency. Often, I stick with classics, things like blueberry or raspberry with lemon zest thrown in. But last weekend, I found myself face to face with a handful of apricots that were either going to get eaten that day or they weren’t going to get eaten at all. Which meant only one thing. It was a morning for almond apricot muffins. 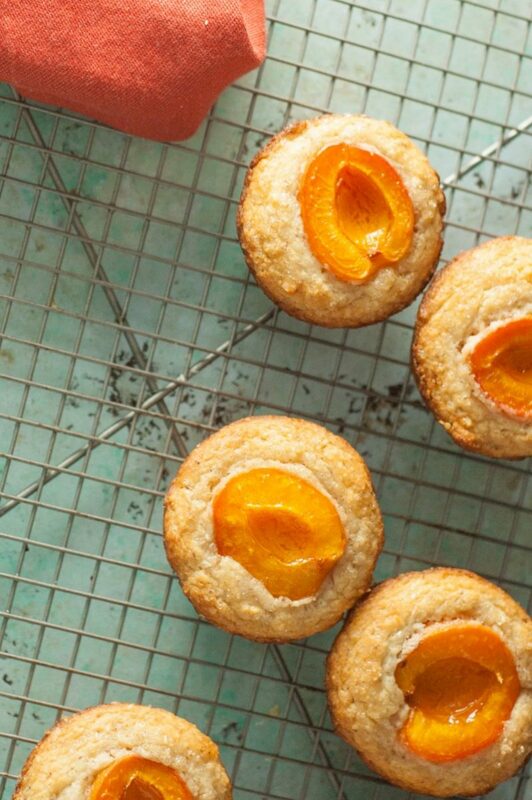 These almond apricot muffins are something special. Of course almonds and apricots are a classic flavor pairing, like almonds and any stone fruit. These muffins are nutty and rich from almond meal, have a gentle tang from yogurt, and get rounded out with a generous amount of vanilla. Then half an apricot gets nestled, skin side down, into the top of each muffin, and sprinkled with big grained turbinado or (even better) demerara sugar. 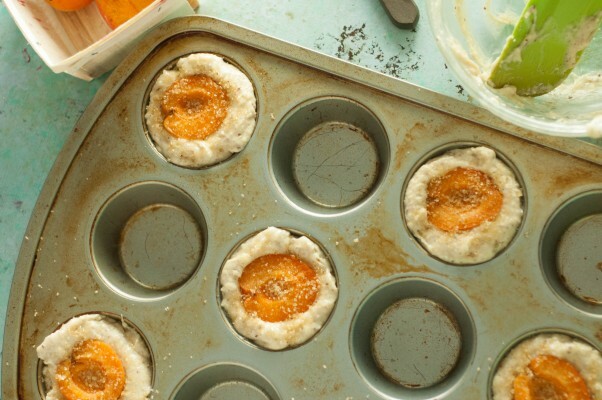 After some time in the oven, even mediocre apricots get concentrated into something fragrant and juicy, and their natural tartness helps to keep these muffins firmly grounded in not-too-sweet breakfast territory. 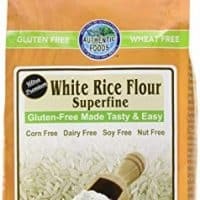 I’ve been playing around more with alternative flours in my baking, and I made this particular batch gluten free with rice flour, but they also work beautifully with all-purpose or whole wheat flour. I often make muffins with oil, as I do with these cinnamon sugar oat muffins and these raspberry lemon muffins. 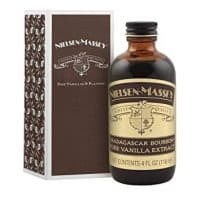 But almond and apricot, as a flavor combination pretty much demand butter, or, to be more precise, brown butter (and if you really want to gild the lily, you can toss half a vanilla bean in with the butter when it’s browning). They make for a lovely breakfast on a slow, puttery sort of Saturday morning. Or really any morning. These muffins play on the classic combination of almonds and stone fruit. 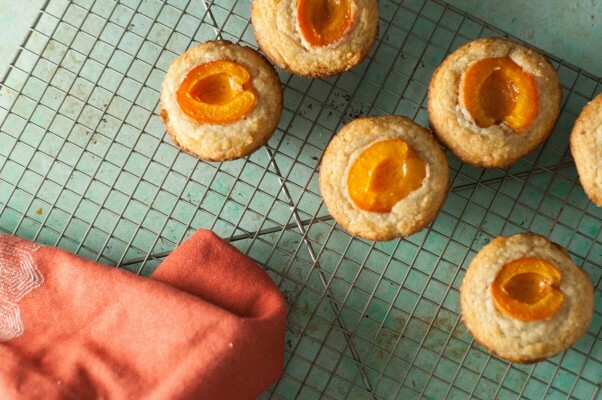 If you don't have fresh apricots around, these would also be delightful with small halved plums or slices of peaches or nectarines. 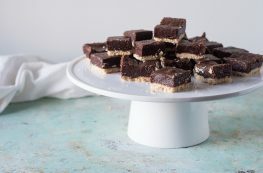 You can make these with almond meal and all-purpose flour or make them gluten free with a superfine rice flour (such as Thai rice flour, which is super cheap if you have access to a local Thai market) and just a tiny bit of xanthan gum for binding power. 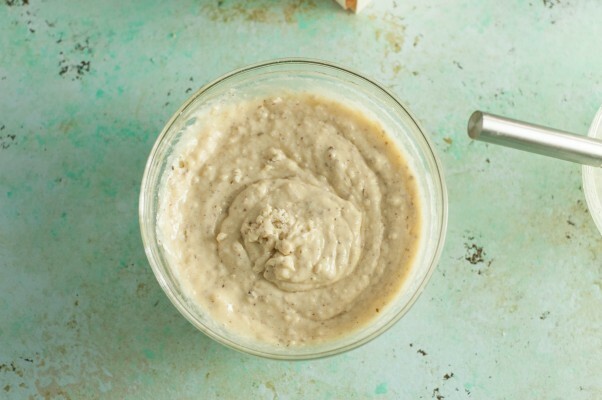 They would also work with whole wheat flour or any all-purpose gluten free flour blend you like. Preheat the oven to 375°F. 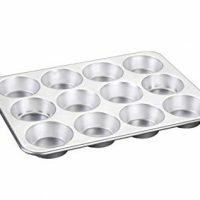 Spray the cavities of a muffin tin with nonstick spray. 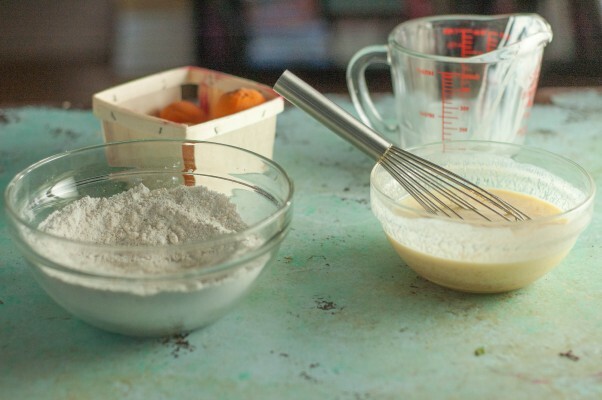 In a mixing bowl, whisk together the almond meal, flour (all-purpose or rice and xanthan gum), baking powder, and salt. 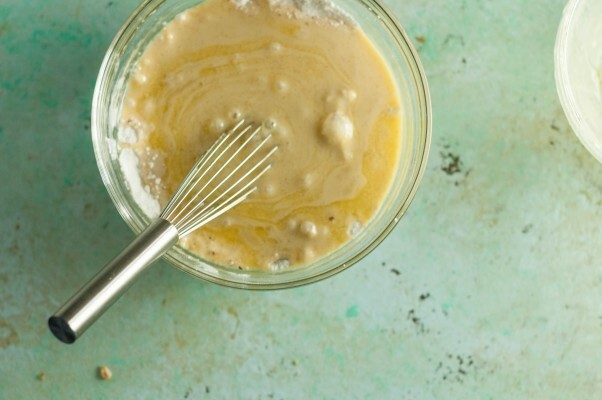 In a separate bowl, add the yogurt, sugar, eggs, butter, and vanilla extract and whisk until thoroughly combined. Add the wet ingredients to the dry ingredients and stir until the dry ingredients are thoroughly moistened (with so much almond meal, you don’t really need to worry about overmixing). 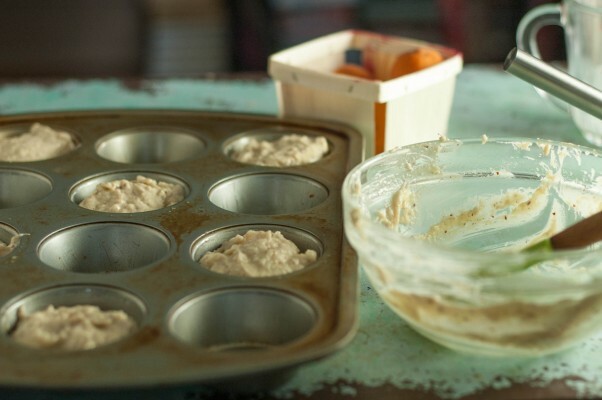 Divide the batter evenly between the muffin cavities. Press half an apricot, skin side down, onto the top of the batter for each muffin. Sprinkle each apricot half generously with turbinado or demerara sugar. Bake until the muffins are golden brown around the edges and a toothpick inserted into the middle (at an angle under the apricot) comes out clean, about 20-25 minutes. 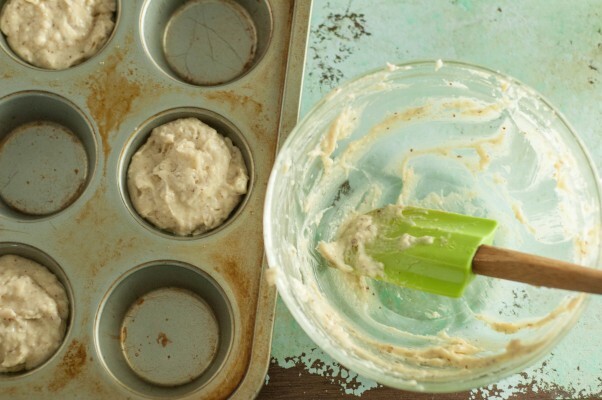 Run a knife around the edge of each muffin to loosen and carefully tip out onto a cooling rack. If any apricots come a bit loose in the process, gently slide them back into place. Let cool for about 10 minutes. Serve. These look amazing — pinned! These muffins look gorgeous! I love the way the apricot garnish looks after they are baked, so pretty! These look amazing! Absolutely bookmarking this for later. I would love just one of those mornings! That sounds so relaxing. First off, I’m so glad you found a creative way to use up those apricots that were starting to go (FOOD WASTE IS A NO NO!). And second, these just sound soooo heavenly and luscious. I can just picture enjoying them by window softly lit by the sun with a cup of tea. I pinned these to make some time in the future! 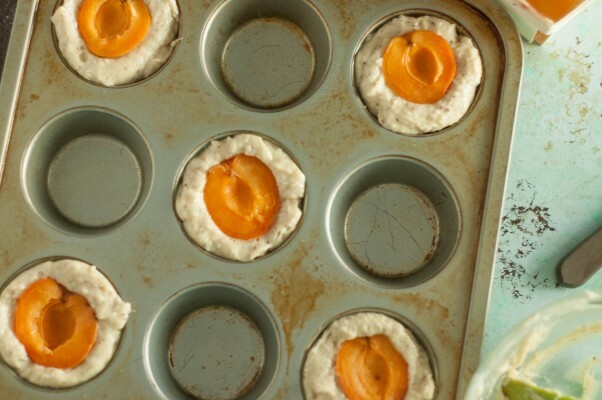 I never thought of using apricots in muffins and why I’m not sure! Every spring we go to a local orchard and picks tons of apricots, this recipe will be perfect thank you!